We take infection control seriously and all members of our staff receive regular update training. Our Infection Control Lead for our practice is Andrea Pisci (Dental Nurse). We have a dedicated decontamination suite in which all instruments are reprocessed. Our dental nurses rotate and take turns to work in the decontamination suite for the day. Immediately after use, dental instruments are soaked in a solution which kills enzymes. The instruments are then transported to the decontamination suite where they are scrubbed with more enzymatic detergent and then rinsed. The instruments are inspected under a magnifying glass and then put in a sterilisation pouch and placed in a steriliser called an autoclave which reaches temperatures of 134 degrees. When the instruments are removed from the autoclave, the pouch is then stamped with the date. Autoclaves are serviced regularly and nurses perform daily maintenance tasks in the decontamination suite and fill in logs such as steam penetration tests to record the steriliser functions. All of our staff (dentists, hygienists, nurses and receptionists) attend regular emergency first aid training. The training involves running various different scenarios of different emergencies with everyone practising with a simulated kit. We have an emergency drugs kit and defibrilator on site. 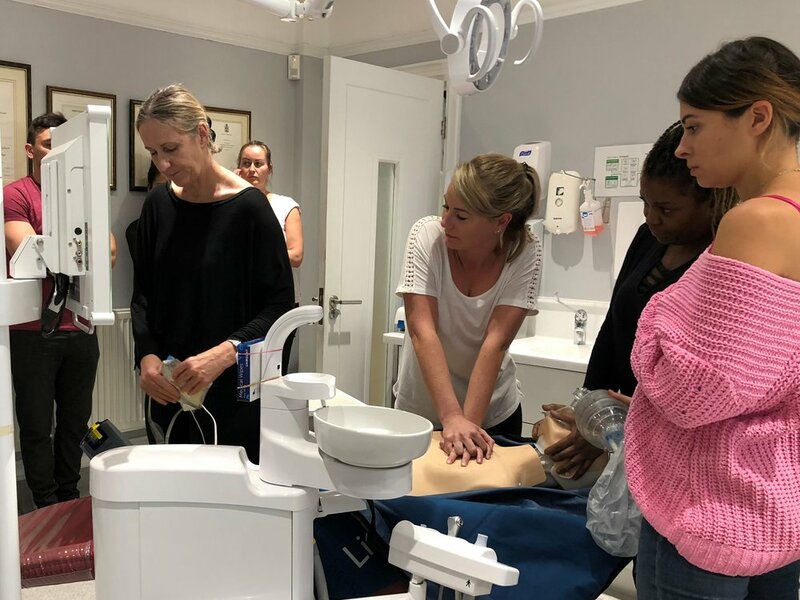 In addition to this, Natalie Stavri and Veronica Ferraioli attend additional training to be the first aiders for Woodford Dental Care. In addition to the above, staff also undertake training in Safeguarding, Radiography, Data Security and a range of clinical topics. Dentists must complete a minimum of 100 hours of training over a five year period and hygienists must complete at least 75 hours of training. Dental nurses must complete at least 50 hours of training. The practice runs various in-house meetings and training sessions for all staff as a whole and for different teams of staff. There is a training meeting most weeks.